This quarter's installment of the Portland Beer Price Index (PBPI) won't surprise anyone. Prices in every category are up, in some cases by quite a bit. The graph on the left isn't very dramatic, I admit, since it's on a scale of $0 to $16. 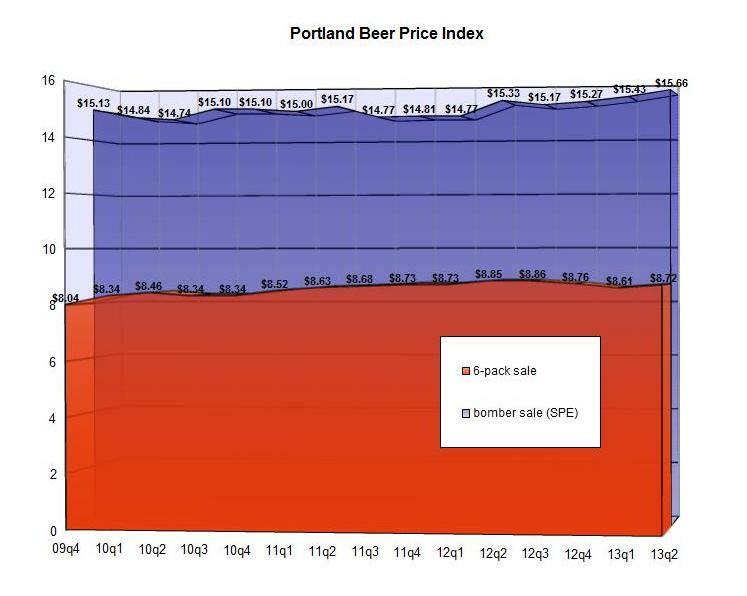 But I wanted to shake things up a bit by giving you a graphic representation of the price difference between six-packs (in orange) and the six-pack equivalent (SPE) price of 22-ounce bombers (in blue). If you want the detailed numbers, click on the graph to see a larger version, but the small graph nicely illustrates the bomber price penalty -- about 80% right now. The average bomber in town is priced like a $15.66 six-pack, when it's on sale. Regular price is now like a $16.36 six-pack. This is the 16th installment of the PBPI (though only the 15th counting the more useful sale/happy hour prices). For the 4th edition (2010Q2), I dropped the Hawthorne Safeway because it didn't have any of the bombers I was indexing. I knew the beer selection was better there since the store was remodeled over a year ago, but it didn't occur to me until the other day that they carry all the beers in the index now! It's always been a struggle to keep a full slate of stores that carry all the beers, so I will happily add them back in to the index next quarter. It also gives me the option of dropping New Seasons -- something I never thought I'd say -- since they are now the only store I canvass that doesn't carry any Rogue bombers. If you require more information on the makeup of the PBPI, read the page which describes the composition of the index. Check back three months from now for the autumn numbers, and meanwhile spread the word about the bomber price penalty.